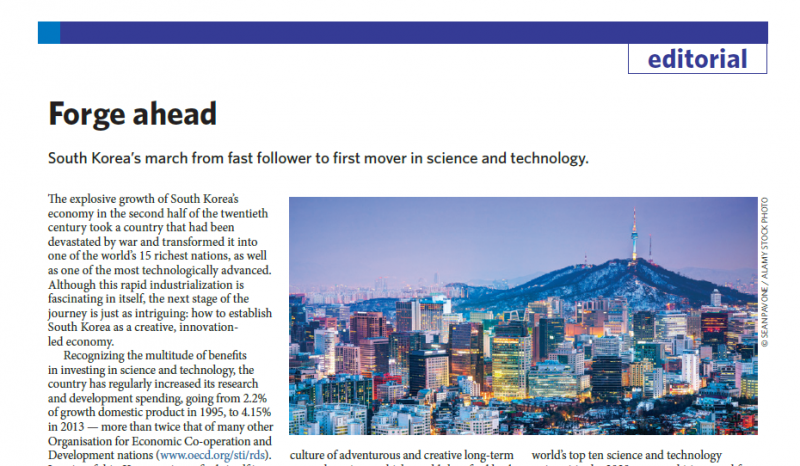 UNIST has been introduced on the editorial page of Nature Physics on December, 2015 as one of the Korea’s first movers in science and technology. Nature Physics publishes papers of the highest quality and significance in all areas of Physics, pure and applied. Like other Nature titles, all editorial decisions are made by a team of full-time professional editors, who are PhD level physicists. Dr. Luke Fleet, a senior editor of Nature Physics, visited UNIST on last October and published an editorial article, titled Forge Ahead. It includes UNIST’s role and its goal to become the world’s leading university in science and technology with the explanation of Korea’s explosive growth of economy. Dr. Fleet explains how South Korea has been marching from fast follower to first mover in science and technology. He also adds that South Korea has been largely investing in science and technology, specifically by launching the government funded basic-research institutions: the Institute for Basic Science (IBS). UNIST has been designated as one of the world’s best graphene R&D institutions, hosting three IBS campus-based research centers. These research centers will be receiving the funding of 300 billion (KRW) over the next 10 years from IBS, South Korea. With the support from the government of Korea and the city of Ulsan, UNIST hopes to contribute to the development of local industry and economy through transferring the research experience, knowledge, and technology of its scientists.